Tuffy Tire & Auto Service Centers’, 6574 E. Riverside Blvd in Loves Park, will host a blood drive from 9am to 1pm on Friday, August 31st, 2012. Tuffy Tire & Auto Service Centers’, 6574 E. Riverside Blvd in Loves Park, will host a blood drive from 9am to 1pm on Friday, August 31st, 2012. You can schedule an appointment to donate by calling 815-639-1239, but walk ins are welcome. Registered donors will receive a voucher for an oil change with 5 quarts of oil (contact Tuffy for voucher details and appointments). In addition, anyone that donates blood at the RRVBC Perryville Donor Center, 3065 N. Perryville in Rockford, on Saturday, September 1 from 7am-1pm will also be offered the voucher. 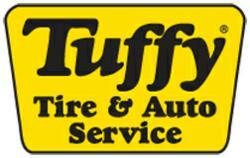 For more information regarding Tuffy®, please visit their website at http://www.tuffyrockford.com and on Facebook at http://www.facebook.com/tuffyrockford.